Turn left onto Olive St. Turn left on Venice Blvd. 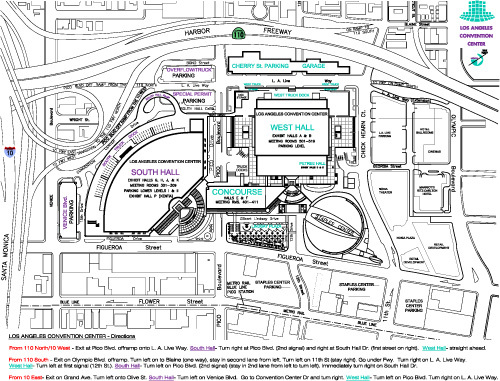 Go to Convention Center Dr. and turn right. Exit at Pico Blvd onto L. A. Live Way. Turn right at Pico Blvd. (2nd signal) and right at South Hall Dr. (1st street on right). Turn left on Pico Blvd., right onto South Hall Dr. Follow signs for Pico Blvd. Take exit toward Olympic Blvd. Turn left on Blaine St. Turn left on 12th St.
Metro provides Bus and Rail transportation to Downtown LA till 2AM on Fridays and Saturdays. For your best route or more info, visit the Metro Trip Planner or call (323) Go Metro or (323.466.3876). To find free parking lots, bike lockers, and bike racks throughout the Metro Rail system, use this map. Take the Metro Expo Line to Pico Station, then cross the street towards the Convention Center. For your best route, use the Trip Planner. Take the Metro Red Line to 7th Street/Metro Center Station, then transfer to the Metro Blue or Expo Line and exit Pico Station. For your best route, use the Trip Planner. Take the Metro Purple Line to 7th Street/Metro Center Station, then transfer to the Metro Blue or Expo Line and exit Pico Station. For your best route, use the Trip Planner. Take the Metro Gold Line to Union Station, then take the Metro Red or Purple Line to 7th Street/Metro Center Station, then transfer to the Metro Blueor Expo Line and exit Pico Station. For your best route, use the Trip Planner. Take the Metro Blue Line to Pico Station, then cross the street towards the Convention Center. For your best route, use the Trip Planner.